Green decks have had the good fortune of keeping a lot of their key cards after rotation. Courser of Kruphix, Sylvan Caryatid, and Polukranos are still with us in the metagame, and with the metagame shifting to green alongside cards like Nissa Worldwaker and Hornet Queen, there doesn’t seem to be anything that can stop their current ascension. Let’s take a look at how green cards I suggested last time fared with the rotation. Eidolon of Blossoms – Well, this was my first big loss. I thought it would go up in value due to casual play and people playing the constellation deck, but it’s dropped to $2 from $3.50. I’ll make it up to you, I promise ^_^. Hydra Broodmaster – Hydra Broodmaster is seeing more play at FNMs, but not in any competitive decks yet so his price of $1 is unchanged. Mistcutter Hydra – Mistcutter Hydra has gone up slightly to $2.50 from $2, which is strange considering how non-existent control and mono blue decks are. Oh well, I’ll take what I can get I guess. 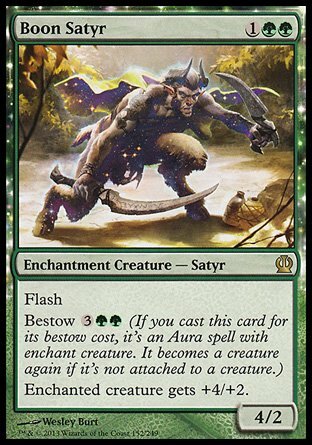 Nylea, God of the Hunt – I jokingly made some kind of comment like “Green devotion just might be making a comeback!” last time and that you should look out for Nylea, and sure enough her price went up as the deck gained more fans. She’s gone up $3 since I recommended her last time to $7.50. Polukranos, World Eater – I said he’d see more play and I expected him to at least hit $7.50 by the end of M15 standard, but I was WAY off. He’s almost tripled in price from his previous value of $5.50 to $14. Sweet. Hope you got yours when it was cheap. Setessan Tactics – My big gamble last time was Setessan Tactics at $0.50 last time, and for once it paid off. It’s current at $1.75, which means you would have saved $5 if you bought your playset during M15 like I suggested. Sylvan Caryatid – “If we see a lot of 3 color decks, I expect Sylvan Caryatid ($6.50 at the time) to go up”. Well, I thought maybe we’d see prices of $8-9, but now that a modern deck has picked it up those days are long gone. I sure hope you got your playset back then, because it’s currently $16.75 in the USA and pushing $20 in Japan. We might never see it drop below $15 again if Jeskai Ascendancy Combo becomes a mainstay in modern. Mana Confluence – It was $11 during M15 standard and my guess was around $15 during KTK standard and the reality isn’t that far off. It’s currently $18 thanks to the 3 color nature of most decks. Nykthos, Shrine to Nyx – I thought some devotion decks other than mono green would make it, but nothing has shown up in standard just yet, causing the previous $5 card to drop to $4.25. Maybe it’s time in standard is over? Scry lands in Control colors – Aside from Temple of Epiphany hitting $9, not many of the other lands have gone up that much. Pain Lands have definitely taken front and center instead like I thought they would. I’m still waiting on the other control color scrys to move. I guess I could have picked anything before rotation and it would have gone up in green. I did very well on quite a few of my suggestions this time around, and can’t believe how much some of these cards went up. I don’t think they can all hold their value throughout Khans of Tarkir, but we’ll see. I feel like Boon Satyr ($1.25) is due for a comeback. Yes you have to deal with his double green casting cost, but with Rattleclaw Mystic and Sylvan Caryatid it could see some play in Temur aggro decks alongside Knuckleblade and other powerful creatures. He works well with Ferocious abilities as well. If Abzan constellation makes a comeback, he could see some play in there too. If he does go up, I’d expect him to hit $2.50 before January. 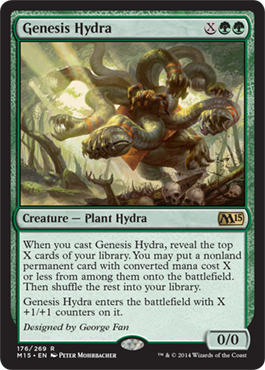 Genesis Hydra was a heck of a lot of fun to play with in Green/x devotion decks during M15 standard, especially in the Hail Hydra deck. 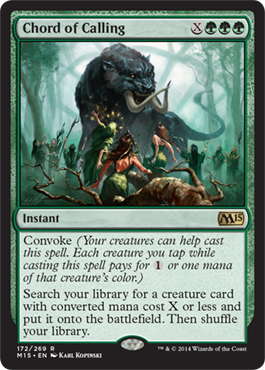 Green devotion will still be around, but GR devotion/ramp also looks like it can be a major player. I think Rattleclaw Mystic will make him easier to play in Temur midrange decks, and he’d be right at home alongside Surrak. I still think he is still undervalued at $3, so if you haven’t gotten your playset yet I think you should pick him up now. There will be plenty of green midrange decks to play him in over the next few months. Casual demand should also help Genesis Hydra keep its value. Now that we’ve switched over to three color decks, I think Nissa, Worldwaker will see a little less play. She’s still going to be an awesome card and be a 4 of in decks like Green devotion, but I think her value should start to dip back into the 30’s from her current value of $41.25. By the time Fate Reforged comes out, I think she should be a more affordable $35 or so. I really like her in my Abzan deck, but she’s only a 2 of in that deck. At most she’ll be a 3 of in a tri color deck, which means all those players that stocked up on 4 for green devotion will have one to spare in trade or to sell. Temur chord decks seem to be on the rise, which means Chord of Calling’s $8 price might be going up soon too. There haven’t been many decks using it lately in standard, so the current value is basically being held up by Birthing Pod decks in modern I think. I don’t know if $8 is a good price to buy it at, but I think I would trade towards a playset if you don’t have one yet. Now that M15 is going to be opened less and less, I expect the price will creep back up in the future. Not a strong recommendation, but I recommend it nonetheless. I didn’t choose too many artifacts last time, but there are a few that caught my eye this time around. 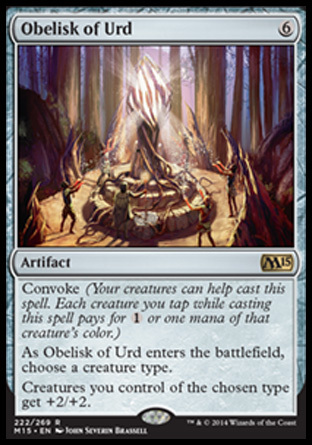 One of my gambles this time is Obelisk of Urd ($1.25). This card wants you to play a lot of low costed creatures at 1 or 2 mana. Right now, the prime candidates seem to be Humans. Khans of Tarkir has brought in a lot of new blood to the tribe such as the Warrior Lords (Chief of the Edge, Chief of the Scales), but I think it’s possible we’ll see more tribes in future sets such as Goblins or Elves to take advantage of this card. While I don’t think it will reach tier 1, Humans could be a possible tier 2 deck next year. If you can get it for under $1, it might not be a bad choice. Perilous Vault ($3) seems like another possible candidate for play in the new standard metagame. We’ve seen very few control decks (or should I say, SUCCESSFUL control decks), and I think it’s due to the lack of good sweepers. Yes we have Anger of Gods and End Hostilities, but if you’re not playing those colors then you’re out of luck. I find this card much better than something like Aetherspouts or Drown in Sorrow in a Sultai deck, and it also works better with Pain Lands. If you’re playing a deck with a lot of counterspells, spot removal, and disruption, Perlious Vault might be just up your alley. The problem is you have to invest 9 mana to use it, but the benefit is that you can play it and leave it on the field instead of keeping it in your hand. This isn’t a strong investment, but if it drops to under $3, then I might pick up a few. During the Return to Ravnica and Theros metagame, I found myself using Pithing Needle more and more in the sideboard. There are lots of reasons to use Phyrexian Revoker now: Nissa, Worldwaker, Elspeth, Sun’s Champion, Sarkhan, the Dragonspeaker, etc. Cheap removal also is at an all time low, and if they do have it I don’t think this card will be a prime target for whatever they have. 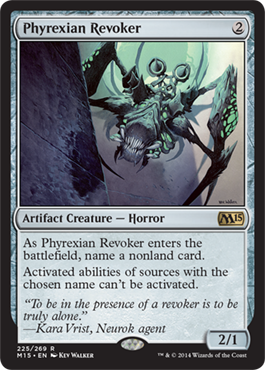 I think Phyrexian Revoker will be a good sideboard card in the upcoming standard metagame and would pick a few up at $1.50 if you don’t have them yet. At the moment, I don’t think there are a lot of good deals to be had in lands. There are simply too many choices and the mana fixing is really good. Budget players can use the life tap lands instead of Scry lands if they don’t have them, and the tri-lands are much better than the scry lands in a 3 color deck as well. Mana Confluence has hit a high of $18 and it should stay around that price at least until January, and Fetches do just about everything else. The rarer Journey into Nyx and Born of the Gods scry lands seem to be doing very well for themselves, and I think they should stay high as long as decks like Jeskai Combo or Sultai control put up good numbers. If you want to make money, you’ll have to pay attention to the shifting metagame. For example, if mono green devotion suddenly makes a comeback, picking up some Nykthos, Shrine to Nyx at $4.25 might net you a dollar or two in profit in the long run. Nemesis of Mortals – Abzan and Sultai reanimator decks should see more play during Khans standard, so I think the Nemesis will make a comeback too. He also shows up in GB dredge decks, so I wouldn’t be surprised if it goes from $0.25 to $0.75 in the next few months. If you have a foil you’ve been sitting on, that might be the time to sell. Reclamation Sage – this card is currently buy listing in Japan at $.50, but it’s only $.25 in the USA. Green is all over the place in the current metagame and will continue to be strong. With decks like Jeskai Ascendancy combo showing up all over the place, you’ll definitely want these in your sideboard. I think It will climb to $1 before long. There was absolutely no time to jump on cards like Courser of Kruphix and Sylvan Caryatid once rotation of the RTR block happened. Most cards, this time around, were bought up about a month before rotation, in August. It seemed as soon as 70% of Khans of Tarkir was spoiled, people got to buying up cards. I say this so that next year you’ll be ready. The most money to be made will be during rotation. I know that today’s list seems a little empty, but I believe that most of the other prices in both green cards and lands have stabilized for the time being and won’t be moving for a while. In my final article, I’ll be talking about the multicolor lands from the Theros block, namely the Gods and then wrapping everything up. I hope to see you back here by the weekend to check it out. If you have any other suggestions, post them down below. Thanks for reading.